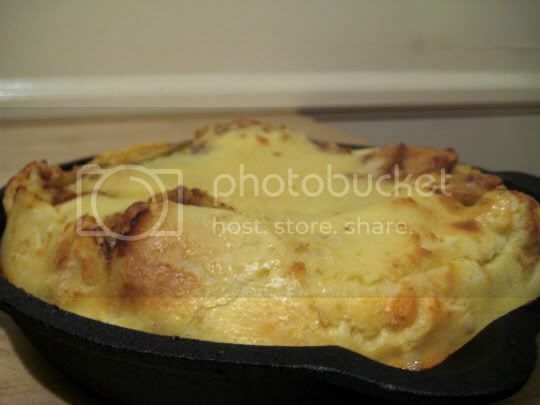 This "puff" (or probably more commonly known as a "Dutch baby") was fun to make, and amazing to eat! I'm not quite sure what I was expecting this to be, but it turned out perfect (except for the fact that I forgot the damn powdered sugar...gasp!). It's basically a big pancake, except this one had fruit on the bottom. Apple and pear slices are cooked in butter, and a fragrant, flavor-filled mixture of cinnamon, nutmeg, and sugar is added. Then, a nice amount of caramel syrup is drizzled over everything. The sweetness seems a little overwhelming (if you were to be eating this fruit mixture alone, let's say), but trust me, it's just right in the end. Once the fruit is soft and cooked through, pour the "puff" mixture into the pan, which is essentially a crepe/pancake batter. This mixture will fill a 10-inch skillet (use cast iron) to the top, so be careful when transferring to the oven. The baking time was right on, and no adjustments were needed. Yum! 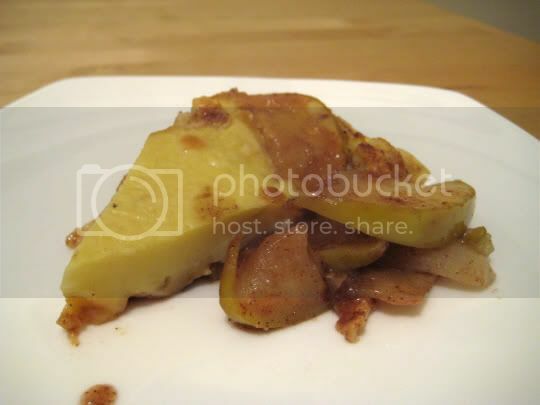 Imagine eating fresh, hot apple pie, but with a topping that seems almost bread pudding-like in consistency, and mild and only slightly eggy in flavor (like...a crepe). In fact, I was surprised that the eggy flavor wasn't overwhelming, even with leftovers. Make again? Definitely, and I will not forget the powdered sugar next time! Different fruit combinations would also be worth trying. I don't think anything could go wrong with this dish!